NOTE: The screenplays we review are often in development and may experience many rewrites, some could end up being completely different than what is reviewed here. It is our hope that our reviews generate more interest in the film. Thank you. History by Hollywood... God help us. During World War II the United States won important battles against the Japanese due to the heroic acts of Native Americans, and the sacred language they spoke, a tongue that at the time was not a written dialect. Hence its importance as a wartime code. An obscure language that has no traceable path. Before reading the script for WINDTALKERS, penned by John Rice and Joe Batteer, I decided to do some simple research and learn more about this fascinating fact of history. I came across an article in the Chicago Tribune by Bill Papich dated March 17, 2000. In it he discusses the development of two Hollywood projects based on the Navajo "Code Talkers." There has been a lot of speculation about this film. Those living Navajo representatives of World War II expressed excitement and hesitation over their story being told. "I think the concern of the code talkers is this is probably their only shot to have their story told in a big way," Red-Horse told the Chicago Tribune. "I think they know they don't have a lot of time left on this earth, and they want to leave a legacy. They want their story to be told right." Hollywood as historian is not a new subject -- the editor of this site has discussed it before. No matter how dedicated a "Hollywood" production tries to be to history, it will ultimately have to take liberties with the story. This is to be expected and understood. Some are justifiable and honorable, others are not. The bottom line, they are making the story to profit from it. But if the story is based on true events, like it or not, the filmmakers do have a responsibility. 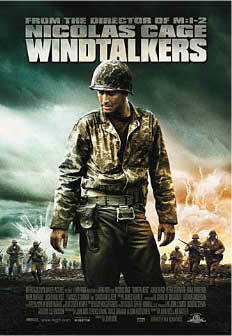 So the question is, where does WINDTALKERS as a screenplay fall? Was it a script that will allow the legacy and the spirit of the Navajo Code Talkers "to be told right"? What follows is my reaction and opinion of the script for WINDTALKERS due to be released this November. The film has already completed shooting. Screenwriters John Rice and Joe Batteer crafted a strong narrative, when at its best extremely riveting. The script opens with a scene of massive carnage. A terrible battle has concluded, the field appears to be nothing but a graveyard of American soldiers. Bodies liter the field, some "disfigured by horrible wounds. Men torn open. Decapitated. Men no longer men," as described by the screenwriters. We focus in on one fallen soldier, "Enders" as it is written on his uniform. He looks beyond dead. A bloody mess. Blink, his eyes open. His face reveals pain beyond comprehension. We enter his eyes and mind during a flashback showing the carnage of the battle. Enders and his men are in a desperate fight. The dead are everywhere. "Goddamn you, Enders. Goddamn you" are words spoken by one of the fallen, as Enders cradles him in his moment of passage. Then an explosion and a dissolve cut to a brilliant and bright sun. Joe Enders is now recouping at Pearl Harbor. His hearing is permanently damaged and his equilibrium is as well. After some rehab he manages to bring his ailing body back to some semblance of health. Enders, a battle tested soldier, and now decorated, continues his service when he could have easily returned home by disclosing his hearing and equilibrium problems. He is given a new assignment. During a classified briefing he learns of the Navajo code talkers and their new importance in the Pacific. He is to be a body guard, to protect one code talker. But thats not all, he is informed of one final aspect of his new assignment. After being shown a photo of one Navajo who had been tortured, beyond recognition, by the Japanese, Enders is told, "the code will be deemed more important than the man." Meaning, the man is not more important than the mission (A stark contrast to the theme of SAVING PRIVATE RYAN) -- he is to eliminate his code talker if a capture is close at hand. Question: is Carl Enders the kind of solider who could carry out such an order? Charlie Whitehorse and Carl Wahzee are the main Navajo characters. Wahzee has a wife and son -- we meet them only for a short moment as he says goodbye at the bus station. Wahzee is smaller, and wears glasses. Whitehorse is a powerful presence. Enders is assigned to protect (and destroy if necessary) Wahzee. Now, if your assignment could entail killing someone, you're not going to want to get to know them very well and you'll make it clear. Enders does this very well. During training Wahzee tries several times to break the ice, and Enders stonewalls him every time. So far so good. I liked the development of the characters and the strength of the narrative. We know what's at stake, the story is very dramatic at this point, and we are presented with enough information so as to judge what's going on without knowing what's going to happen. However, at this point though all is well (we're about 25 minutes into the script), I found myself wanting the story to give me a better understanding of the code talkers. Right now the development of Whitehorse and Wahzee is fairly superficial and bordering on stereotypical in my opinion. After a few training scenes the story moves to the war. The war sequences in the script are filled with some solid writing. Very descriptive, but not over the top. I thought it was fairly original and it really kept my interest. The action isn't non-stop, we get some exposition and character development that really services the spine of the story. I was reminded of the writing from HAMBUBRGER HILL and the recently released on video TIGERLAND. Enders and Wahzee, spending more and more time together, obviously will either grow to hate each other, or to respect. Joe's defense begins to wear down as he begins to see Wahzee as a person, the turning point is when he sees a picture of Wahzee and his family. But not until after a fantastic sequence where together Enders and Wahzee capture a Japanese radio and call off a barrage of Friendly Fire that was reaping havoc on their company. Once again, solid writing and some great suspense. Eventually Enders realizes he is comprising his mission as he develops his friendship with Wahzee. We know this as he makes a request for transfer. It is denied of course. So, the scene is set, and perfectly I might add. Joe, the torn hero, must decide between the mission or the man. And how do we even suspect that he could do it? And does he actually have to do it? Well, I'll leave you to your imagination until the movie comes out. All I can tell you is, no matter what you expected you'll be surprised and disappointed as I was. That's as far as I want to go in terms of discussing the story line. But what bothers me, deeply, is the wasted opportunity these screenwriters had. They clearly made this "Joe Enders" story and not the "Code talkers" story. Very, very disappointing. But after all, with a story like this you can get someone like Nic Cage to star in it, if the central character had been Native American who and the hell would have played him? No one near the celebrity status of Mr. Cage, to be sure. Now the screenwriters could argue, that in order for there to be a dramatically appealing story, and not a docudrama, they had to make the POV of the story focus on a central character such as Enders. Now I'm saying "could," as I have no idea what their response would be. But what is very evident in my mind, the story could have absolutely focused on Wahzee (for example) and still have been a very satisfying and dramatically appealing one. I'm afraid that the story of the Navajo code talkers as told by screenplay for WINDTALKERS is not going to be what most of us had hoped for, not even close. Hollywood, and the screenwriters working for the machine, are doing it all wrong when it comes to history as represented in the films they make, at least in the last 3 or 4 scripts I've read. If you were hoping to learn something about the code talkers, the Navajo people, and their language, sorry, you will be stupefied beyond belief at how clich� ridden and dumbed down this story will be presented. A final note about the script: The ending, I don't know if I've ever read a weaker effort. It's contrived beyond description. Remember the ending of RETURN OF THE JEDI? Where Luke sees the ghost's of his father (Darth Vader), Obi-Wan, and Yodi? Well, I don't want to give it away, you'll know what I mean if they keep the ending as is. Lets hope not. WHY CANT I BE AUDREY HEPBURN?